The Spring 2019 Convention (Las Vegas, NV) will be headquartered at the New York-New York Hotel & Casino - located at 3790 South Las Vegas Boulevard, Las Vegas, NV. This will be a 3-day Convention. Convention Activities: Registration and sign-in will take place in the New York-New York lobby adjacent to the Registration Desk and Business Center Desk starting at 8:30 AM on Friday, Saturday and Sunday, with buses departing promptly at 9:00 AM each day. Friday: We will visit the St. George, Utah and the RTC Downtown Transit Center. There will also be an evening Las Vegas attractions tour at no additional expense. Saturday: We will visit the RTC Maintenance Facility, Laughlin, and the Arrow Stages Maintenance center will be visited. Sunday: On the final day we will visit Lake Mead, Boulder Dam and the RTC Transit Centers. Convention Registration Information Package is now available - see the link under "Our Next Conventions" below. The deadline for making hotel reservations using the MBS discounted room rate is now: Friday, April 12th. Check the MBS web site and Facebook page for up to the minute updates on planned convention activities. WELCOME TO THE MOTOR BUS SOCIETY WEB SITE! The Motor Bus Society was founded in 1948 as the National Motor Bus Association. The purpose of the organization then, as it is now, is the collection and publication of information about the history and development of the bus industry in North America . Motor Bus Society members includes industry professionals, students and members of the general public who have an interest in bus transportation industry and bus equipment. Twice per year, the Motor Bus Society members holds two conventions in the Spring and Fall. Conventions feature bus excursions (sometimes on historical equipment), bus garage and bus facility tours and photo stops. As a member of the Motor Bus Society, you will also receive our quarterly publication, Motor Coach Age. Selected back issues of Motor Coach Age and Motor Coach Today (no longer published) are still available for purchase. Just let us know if you wish to purchase back issues. Now celebrating our 71st year, the MBS has over 600+ members in the US, Canada and abroad! We invite you to become a member of the MBS. In the meantime, enjoy our website, which offers photos of bus equipment and summaries of current issues of Motor Coach Age and past issues of Motor Coach Today. 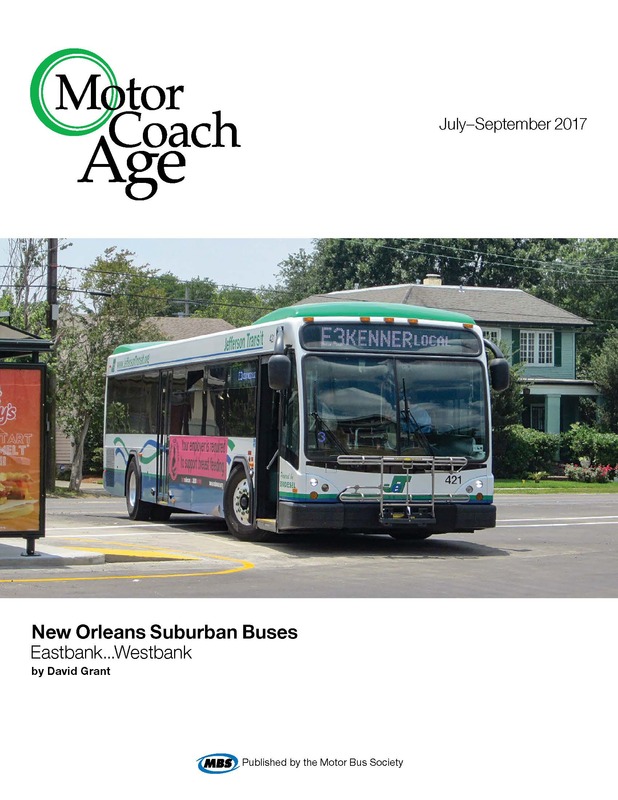 The July - September issue of Motor Coach Age features the story of local transit service in the parishes surrounding the City of New Orleans along the east and west banks of the Mississippi River.